We have a range of spikes and supports that will help you to install your fences easily no matter what the circumstances. Unsure of what you need? Then take a look at the diagram to help with your selection. Please see our range of spikes and supports below. Allow you to site posts where digging holes may prove difficult, or where you don't wish to disturb the area surrounding the post. We stock two types of Post Supports in a range of different sizes. Ideal when a more lightweight solution is required, it allows for easy post removal and replacement. Better suited for larger heavier projects such as pergolas and decking. System 2's secure twin bolt mechanism allows even easier post installation and replacement. The wedge holds each post in a vice like grip without the need for nails or screws. 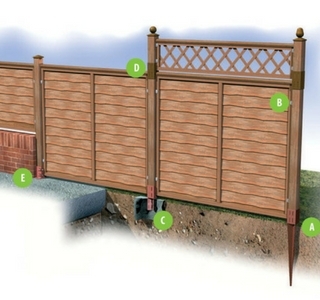 Post extenders raise the height of an existing fence by allowing you to add on additional fencing or trellis. Plan the position of your posts when laying concrete and bed in the concrete-in anchor before it sets. These post supports bolt down to aid in positioning of posts that are being fixed onto an existing concrete base. Allows you to repair broken or rotten posts that have been concreted into the ground. We have a range of repair spurs for different applications. The red finish for timber - with wedge grips on them. We have driving tools available in 2 sizes and they facilitate driving the post support into the ground to keep up your panels.